The seeds of celery (Apium graviolens) have been used as a herbal medicine since antiquity and beneficial properties have been reported to include anti-bacterial, anti-inflammatory and diuretic effects. In this study, by employing organic solvent extractions, column chromatography and HPLC, a crude alcoholic extract of celery seeds was fractionated and the principal fractions were assayed for their activity against Helicobacter pylori. 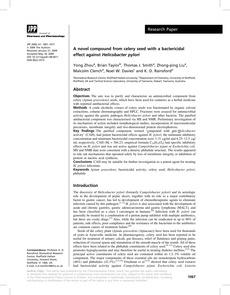 A component was isolated that had potent bactericidal effects against H. pylori; the minimum inhibitory concentration (MIC) and minimum bactericidal concentration (MBC) were 3.15�g ml-1 and 6.25 � 12.5 �g ml-1, respectively. This is within the range of the MIC and MBC of tetracycline, which were 3.15 �g ml-1. On analysis by mass spectrometry (MS) the compound was found have a molecular weight of 384 and the empirical formula C24H32O4. This compound was termed Compound with Anti-Helicobacter activity (CAH) and was found to have specific inhibitory effects on H. pylori, since no inhibitory activity was detected against Campylobacter jejuni or Escherichia coli. MS and NMR data are consistent with a dimeric phthalide structure, whilst preliminary investigation of the mechanism of action appears to rule out mechanisms that operate solely by the common pathways of loss of membrane integrity or inhibition of protein or nucleic acid synthesis. These results suggest that the new compound may be suitable for further investigation as an agent for treating H. pylori infections.